Develop new technologies that address current challenges in agriculture, horticulture and natural resource management using expertise from the latest in science, technology and mathematics to underpin innovations in plant and animal production. Precision agricultural technologies embrace all facets of agriculture developing innovative, low cost and accessible technology for industry and farmers. 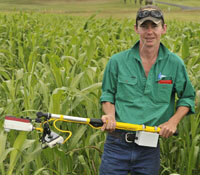 The future job market outlook for a precision agriculture specialist is good and increasing. Helpful job skills include report writing ability, analytical skills, good critical thinking skills, problem-solving skills, active listening, good communication skills, good IT skills, and knowledge of agricultural industry. Look out for outreach activities in precision agriculture at UNE for schools, as well as tertiary and vocational education students, to build capacity of our future farmers.